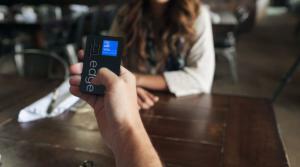 SANTA CRUZ, CALIFORNIA, UNITED STATES, May 24, 2018 /EINPresswire.com/ -- Edge Mobile Payments, LLC ("Edge"), a Santa Cruz based fintech startup with offices in San Francisco and Kraków, is proud to announce that it has acquired a comprehensive Cloud Wallet® and mobile payments IP portfolio, including ring and watch NFC payment technology with priority dates going back to early 2005. Edge is already in negotiations with several market leaders to license its new assets. The Assets portfolio acquired from Nexus Payments includes 18 IP assets: 2 issued utility patents, 14 patents pending, 2 registered trademarks (including the Cloud Wallet® trademark) as well as a functional Cloud Wallet® prototype. Products based on this new IP, including NFC ring payment devices, will roll out after they are integrated into the Edge product line. Edge's breakthrough Cloud Wallet® technology includes a browser-based online payments system that facilitates purchases and removes complexity from existing financial transactions. Given that up to 60% of all online shoppers abandon their purchases prior to completion, there is a strong market demand for simpler, faster, and more consumer-friendly payments via the Web and at POS.